Steven Chepa was born April 25, 1939, Hamilton, Omntario, Canada – business executive and philanthropist of Rusyn descent in Canada. A graduate in commerce from McMaster University in Hamilton, Ontario (1962), Chepa has been a director and officer in several Canadian companies; in 1978 he became president of the Cheppa Corporation which specializes in merchant banking. During the 1990s he became seriously interested in his Rusyn heritage and began to fund projects related to the Rusyn national revival in Europe. He established the annual Dukhnovych Prize for the best original work in Rusyn literature (1997), the Steven Chepa Award for Outstanding Contributions to Rusyn Culture (2001), and the World Academy of Rusyn Culture (2002) to promote knowledge about all aspects of Carpatho-Rusyns past and present through the Internet. „If the law system works in Slovakia, the court will prove that we are the legal owners of the car park as we have paid the previous owner the total price we agreed on. If the judicial system does not work, our case will be a great warning for all the foreign investors,“ says Steven Chepa, Canadian entrepreneur and financial expert who invests in Slovakia, he buys real estates, constructs new family houses and remodels hotels. He was born in Hamilton, Ontario, Canada. He is the son of Lemko Rusyn immigrants from the Carpathian Mountains who were born as subjects of the Austro Hungarian Empire. Steven’s mother was born in 1905, in Uscie Ruske, subsequent to Action Visla in 1947 renamed Uscie Gorlickie. After considerable success in America, Stevens’ grandfather returned to Uscie Ruskie just before the First World War only to be conscripted into the Austrian Army. Steven’s Great Grandfather was imprisoned, his daughter, Steven’s grandmother, had to travel all day each day to bring food to her father and Stevens’ mother, at nine years of age, was left to look after three children. Each time the military passed through the village, Steven’s mother fortunately managed to hide. Her father was taken a prisoner by the Russians, returned home as a broken man, and died soon afterwards. In 1929, Steven’s mother emigrated from Poland to Canada. Steven’s father was born in Malyj Bereznyj, in the village bordering with Slovakia. Once this territory belonged to Austria Hungary, then to Czechoslovakia and today as Transcarpathian Region (Oblast) it is part of the Ukraine. After a short career as a cantor (dyak) in training for the priesthood became disillusioned with the corruption within the church at that time, lost his faith, and in 1927 emigrated to Canada. After a difficult time and, fortunately for Steven, meeting his wife “to be” in a park in Toronto, Canada, Stevens’ parents had saved sufficient money to buy a small bakery in Hamilton. Steven as a boy and as young man used to spend many nights working in the bakery and many days delivering bread to his fathers’ customers. Norstone Financial Corporation owns 100% of the Global Prime Office Network. Global Prime Office operates five business centres in Toronto, Mississauga and Montreal (www.gponetwork.com). Norstone Financial Corporation recently owned 50% of the Dicon Global Group of Companies, which maintain research facilities in Toronto, Canada manufacture smoke and gas alarms in China and distribute throughout the world with offices in Toronto, Canada and Cheltenham U.K. In April 2006 Norstone sold its 50% interest in this group for $26,000,000. „My parents always stressed the importance of education to be able to understand the world and live life to the fullest“ Steven Chepa says about his childhood. He attended McMaster University to earn an Honour Bachelor of Commerce degree and then articled with Price Waterhouse to become a Chartered Accountant. Soon after, he accepted a position with a large international corporation and in four years, at the age of 30, had risen in rank to Vice President and General Manager of this corporations’ security alarm business in Canada. In 1972, an opportunity to buy a bankrupt business for very little money presented itself. Steven could not resist and launched himself on the entrepreneurial path he has continued to this day. He has personally operated firms which design electronic products in Canada, manufactured these products in Canada, Mexico and China and distributed these products around the world. He currently owns and operates five office business centres in Canada. He has served as a director of many private firms and five public corporations in Canada with interests who range from the manufacture recreational vehicles to navigation aids to home electronics and security systems to biometric fingerprint identification to bio analytical laboratory services and new drug development. 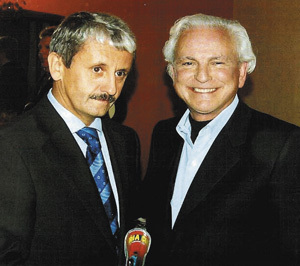 The successful businessman and philanthropist from Canada – Steven Chepa meeting the then Prime Minister of Slovakia Mikuláš Dzurinda in Bratislava. Mr. Chepa, you are an experienced man who has gone almost through everything what your life offered and brought you. Do you still have your visions and goals? In my lifetime, the world has definitely become a better place for man. Yes, the atomic bomb was invented, terrible wars have been fought and unthinkable atrocities have taken place. Yes, terrible things continue and there is no force willing to end the genocides which continue in places like Darfur. Yes, we have new problems such as preserving spaceship earth’s ability to sustain life but, today, more people are enjoying a better life than ever before in the history of mankind. Provided that people remember the sacrifices that have made this possible and are willing to work hard, sacrifice for future generations and even die, if necessary, to preserve our freedoms the condition of man will continue to improve. With widespread education, as a result of the internet, more accessible than ever before, I am confident that fundamentalists of all persuasions will continue to lose their ability to deceive and control the thoughts and actions of their followers, and the likes of Hitler and Stalin will never gain power again, though I am well aware that many will try, and that the current situation in the Middle East is extremely dangerous for all mankind. I have been economically fortunate in life and consider the wealth that I have accumulated to be held in trust to be used to help make the world a better place. I will continue to contribute for as long as I can. Why did you decide to invest in Slovakia? Though I thoroughly enjoy the process of inventing and supporting the development of new products and processes, thereby improving the productivity of man, I have also become very active in the movement to record and, if possible, preserve and continue the evolution of Rusyn Language and culture in its historic homeland in the Carpathian Mountains. Rusyn is a rich culture with music, literature and insights with respect to the human condition which may be of benefit to individuals throughout the world. It all started at the Sixth World Conges of Rusyns (my first) in Prague in 2001. I had founded the Rusyn “Oscar” which was retroactively awarded to four previous winners of the Alexander Duknovich Prize for Rusyn literature as well as to Vasil Turok, Director of the Alexander Duknovich Theatre in Presov and Volodymyr Mykyta a widely recognized and honoured Artist of Ukraine. After the conference, it was my privilege to travel to Uhzhorod to present the 2001 Duknovich prize to Ivan Kalynych. I took this opportunity to explore the road from Bratislava to the High Tatras, through Presov and Kosice and to Ukraine. I was impressed with my welcome at every turn and the beauty of a country which belonged to only 5,000,000 people. With the reforms of the Dzurinda period and Slovakia’s integration in the EU, Slovakia became an attractive place to invest with an acceptable level of political risk. 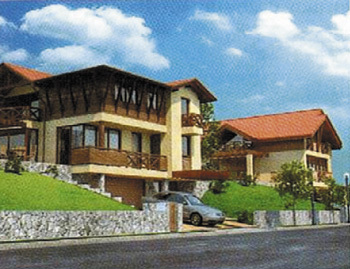 Types of family houses offered in Slovakia by Steven Chepa’s Company. Your first investment and developer project in Slovakia was to construct family houses in Košice for more demanding clients in the area of Kavečany. Why did you invest in the development of better quality housing? I noticed that there was a great need for better housing and was certain that Canadian construction and management techniques could reduce the cost of a single family home sufficiently to enable these homes to be sold at prices that many more Slovaks would soon be able to afford. Starting cautiously, our first project in Kavechany includes 24 large executive homes, structurally built in the Slovak tradition, but finished to a very high standard and intended for those who can appreciate and afford the very best. Our second project will consist of smaller homes, Canadian structural techniques, luxurious finishes and prices in the vicinity of 5,000,000 Slovak Crowns. Norstone provides its clients with full developer services and construction of these “turn- key” houses. Do you believe that you will break conservative and rather refusing opinions on developers? There will always be people who will wish to build their own home, some of them with their own hands. Most people, however, are content to have anyone build their house provided they get what they want, that is, a home built and finished in accordance with their taste at the lowest possible price and in a size they can afford. The only way they will ever achieve this is to deal with a full service developer. To buy such a home in pieces, means they will have to do a lot of shopping, will pay retail prices for all parts and may or may not succeed in acquiring all components necessary to create a unified whole. A full service developer has international reach, buys most parts of the project at much lower prices than any individual in Slovakia could achieve and can sell the home for less money than it would cost for any other person to build. Full service developers will continue to exist for as long as they provide the homeowner with the best value in any given locality. Every developer, especially foreign one, has tried to realize a good project through its subsidiary established for this purpose. Usually, it is a public limited company which ends its operation straight after finishing the project. From the client’s point of view, it is important to know who will provide warrantees of quality of work and of a house. Norstone is a reliable partner, it will not fail and no house buyer will be left with less than our agreement commits us to provide. All warrantees will be honoured in full. My reputation and self respect are worth far more than any amount I would need to contribute to correct any conceivable deficiencies. What is your experience with the Slovak market? To date, my experience in the Slovak market has been both good and bad. I have met many very nice people, working hard to make an honest living and to make a significant contribution to the new Slovakia. Unfortunately, I have also had the misfortune to pay for property in the High Tatras, title to which remains in the hands of others. In this particular case, Norstone agreed to buy a building and a land plot around it which was intended to serve as a parking lot. As documents were being prepared, Mr. Hirjak, Norstone’s Chief Executive in Slovakia, at that time, informed me that our lawyer, at the time, who had told us early in the process that he was also acting on behalf of the original seller, had indicated to him that he would transfer the title to a middleman who would transfer title to us in exchange for the purchase price in official money from our bank. In November 2004, Mr. Hirjak reported that the middleman, was demanding that we transfer the full purchase price for the property to the middleman even though the necessary documents for the title transfer had not been produced. He also reported that our lawyer, who was also the lawyer for the original seller, had informed us that because he had accidentally forgotten to obtain a confirmation document from the Heritage Department of the Ministry of Culture of SR to the effect that they would allow this transaction to proceed (a sellers duty), the transfer of title to the building would be delayed for a few days. I do not understand yet. What was the problem? Didn’t you sign a contract or your lawyer was sitting on two chairs at the same time? 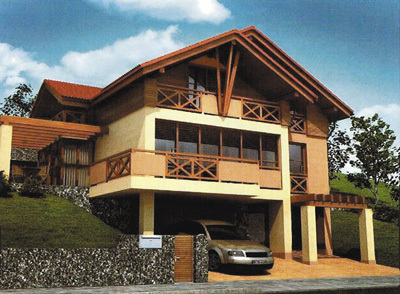 In the written purchase agreement, Norstone Development Tatry, s.r.o. had agreed to transfer the full purchase price in official money from its bank account to the middleman as soon as the title transfer proposal filed earlier at the Property Register (Kataster nehnuteľností Poprad) was properly supported by all documents necessary for the Kataster office to officially transfer title to Norstone Development Tatry, s.r.o.. Mr. Hirjak reported that our lawyer had explained to him that transfer of title to the parking lot land would need to be delayed until a new survey document could be prepared and filed, but that this was a mere technicality and that title would be transferred as soon as this document was filed. The necessary Heritage Department Documents were received a few days later than anticipated, title to the building was transferred to Norstone Development Tatry, s.r.o. and the full purchase price was paid to the middleman as previously agreed. So you paid for the building and the parking lot but the middleman has not transferred the property rights to your company… Why? Within days thereafter, Mr. Hirjak informed me, that the middleman had demanded compensation for an alleged missed opportunity to earn 17,000,000.-SKK as a result of his inability to buy a claim against a business as a result of having to wait a few extra days to receive Norstone´s money. Norstone refused to consider this ridiculous claim because the middleman was responsible according to Slovak law for the provision of this necessary document and this document was a precondition for the transfer of money from Norstone‘s bank account to occur. With respect to the parking lot land, the necessary survey document was filed in due course and the original seller transferred title to the middleman soon thereafter. Have you begun legal proceedings against the lawyer and the middleman? In February 2005, I received a message from Mr. Hirjak that the middleman had suggested he would release the parking lot land in exchange for 10,000,000.- SKK. This case has been referred to the civil court in Poprad and we are now awaiting the outcome of the process. What kind of verdict do you expect? If the legal system in Slovakia works, the court will confirm that we are the legal owners of the parking lot by virtue of having paid the previous owners the agreed selling price in full. If the legal system does not work, this incident is a huge red light for all foreign investors. There are difficult people in every country. Where there is rule of law, difficult people will be dealt with. Without rule of law, honest people will sufferIf the law system works in Slovakia. Do you think that former communist countries have not sorted out the issues of corruption in justice and actions of dishonest lawyers? Do you plan to invest in Ukraine? I have not invested in Ukraine so far because I have not been willing to take the political risk. There are signs of improvement, but not sufficient to entice me into investing in real estate at the present time. A factory manufacturing products for world markets is a different matter. Norstone is discussing a project in which Norstone and its partners will control access to world market customers. The factory in Ukraine will have no value for any Ukrainian who might insist that Norstone needs a Ukrainian partner. Should such pressure arise, the factory will lose its customers, the workers will lose their jobs and Ukraine will be poorer. This is a case where Ukraine needs the jobs and the consequences of corrupt interference are such that it is in everyone’s interest to deal with corrupt individuals in no uncertain terms. I am optimistic that agreement with respect to the first factory will soon be achieved. Beyond that, my father was born in Malyj Bereznyj which is now in Ukraine. I have a soft spot and would like to do something to help those very poor people of the neglected region known as the Transcarpathian Region of Ukraine.